I had the opportunity to review a recent book from Sybex/Wiley. This book is part of their Autodesk Official Press. the authors are Ryan Duell, Tobias Hathorn and Tessa Reist Hathorn. 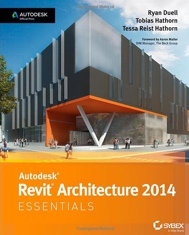 Summary: The book is a very good introduction to the essential areas and uses of Revit Arch as a BIM tool. It explains concepts and perspectives in easy to understand language. It does on assume that you have experience with the tool or the BIM arena. The authors use images and screen caps with great effectiveness to illustrate their points along the way. This book is well worth taking a look at. The book opens with a great Forward (which I always read) by Aaron Maller, BIM Manager at the Beck Group. His insight and road map to how he gained BIM and Revit expertise is a story that all novice learners should take to heart. IT may take a while to gain sufficient knowledge into these advanced tools. The book then launches into the Introduction that explains what the writers hope to tell you and how to use the book to your advantage. There is also a quick synopsis of each chapter that can give you a good idea of what is covered that may not be gained from looking at the Table of Contents. Marching forward through the 14 chapters in the book will allow you to gain an essential overview and experience just as the book promises. Starting with the User Interface and ending with Best Practices and Quick Tips. Chapter One full escorts you around the interface and the tools you will come to know and love. Chapter 2 moves straight into Walls and Curtain Walls, then the following chapters cover Floors, Roofs and Ceilings, Stairs, Ramps and Railings (where I spent some time running through the exercises). Continuing on into the “basecamp” of Revit – Families rounds out the basics. The next few chapters cover Schematic Design, Rooms and color fills plans, Materials and Rendering then on to Worksharing – slow down here to get a good grasp of how this all works. Details, Annotation and Drawing Sets give you a full project view of applying the software to actual work you may be doing. Finishing up with Workflow, Sitework and finally Repetitive Objects, Best Practices and Quick Tips, like modifying your double click settings and using Revit to do your math work. At the end of most chapters is a “Beyond the Essentials” section that points you toward going farther and higher. Sprinkled throughout are suggestions, real world perspectives and break out boxes covering related topics. I spent some time in the stairs chapter going through the exercises, step by step as if I new absolutely nothing about the program. I had to go back and read again as I was anxious to move forward and as a typical student I thought I knew where they were headed. The authors take the time to provide each step and sometimes “assume” you know where some tool icon is located, but the depth of their process of escorting you along keeps you on track. They do provide screen caps of the tool icons and show you were to go most of the time, but I did have to search around a few times and turn back a page or two to find the specific icon. I may be overly critical about this, but I have been in many classroom environments where you needed to remind the student of what they already know. All in all, the 390 page book is well worth it for those who want to jump into Revit Architecture and not just see a list of “do this – do that – then do this” without much context and reasons why. When they tell you to do something – like duplicating materials or objects – they tell you why. Often the why is as important or more so that the what or when. Grab a copy of this book and take a look for yourself. Interesting side note: the cover image was provided by HMC Architects, a firm where I served as CIO for 5 years.